Chinese New Year, also known as the Lunar New Year and Spring Festival, is the most important holiday in Chinese culture. It begins on first new moon of the new year as determined by the traditional calendar in the Chinese almanac, and ends on the 15th day. Its ending on the 15th day is celebrated with the Lantern Festival which symbolizes the light and warmth of spring. In the modern calendar, CNY begins on February 3. The Chinese zodiac rotates every twelve years, where each year is represented by a different animal. 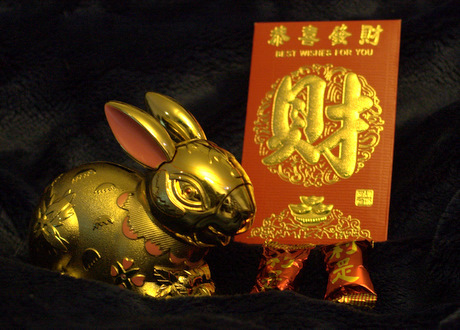 This year is known as the Year of the Rabbit. Similar to the Western zodiac, the Chinese believe people have certain personality traits based on the sign of the year they were born in. Rabbit people exhibit positive characteristics of being pleasant, affectionate, gentle, artistic, sophisticated, and cautious. The Chinese believe strongly in balancing forces so there are also negative personality traits of indifference, temperamentality, secretiveness, and disloyalty. I was born in Canada but grew up in a household that followed very traditional Chinese New Year rituals, with preparations beginning a week or two before the celebrations. One of the tasks was cleaning the house from top to bottom by new year’s eve (not one of my favourite parts of CNY), which was all about getting ready for a fresh start to the new year. Clearing out the old means making room for the new. This could also include repaying old debts and mending strained relationships. Since so much of CNY revolves around food, my family would be shopping for ingredients and cooking for much of the week leading up to CNY’s eve. In Richmond, there are special events taking place at the International Buddhist Temple, Yaohan Centre, Richmond Centre, Parker Place Mall, London Heritage Farm, Aberdeen Centreat, LuLu Island Winery, and Hakkasan Contemporary Chinese Cuisine Restaurant, among others. More information can be found on Tourism Richmond’s website. Aberdeen Centre is the newest and largest Asian mall, and is probably the most approachable for non-Asians. It has ample parking, a great food court on the third floor, restaurants scattered throughout, and Daiso (a two level store where almost everything is around $2 or less). They have many special CNY activities planned, including a gift fair, stage shows, orchestras, and dance performances. The full listing can be found on their website. Tourism Richmond recently hosted a CNY media event at Aberdeen, and I was excited to attend since more than a few years stand between my childhood memories and the current Westernized lifestyle. We started things off with a visit to the Ten Ren Tea shop. 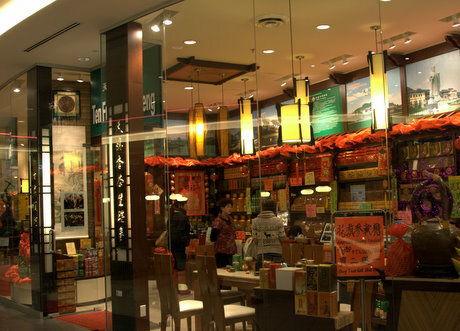 This is one of two tea shops that the company has in BC; the other is located at Main and Keefer in Chinatown. While the company is based in Taiwan, they have over a thousand store locations in China, some with restaurants where they serve foods made with tea. They also opened the Tenfu Tea College in China in 2007 where students can study tea culture, cultivation, processing, and marketing. Ten Ren also specializes in ginseng, but our group’s main focus was on tea. While the North American beverage hot beverage industry is dominated by coffee, there are many dedicated tea aficionados locally. As a child, I mostly drank the black tea commonly served in restaurants and the home. Ironically, it was only after I became interested in food that I went back and started learning more about the thing I’ve drank my whole life. For those who are not very familiar with Chinese tea, the shop gives away a handy tea reference pamphlet. It gives an overview of tea culture and history, and has a very useful brewing chart that lists tea type, quantity of tea to use, water temperature, type of tea pot, and steeping time. The Chinese teas known as black, green, and oolong all come from same plant. The differences are due to the manufacturing process, such as the amount of fermentation. 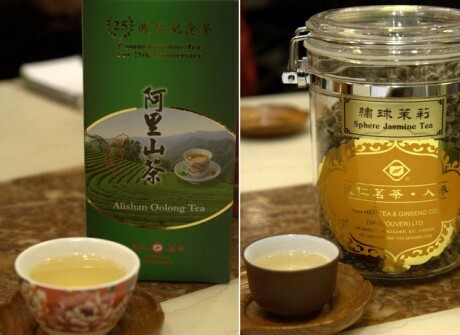 Green teas such as Jasmine are lightly fermented, oolong is a medium fermented tea, black is fully fermented. For green and more delicate teas, glass or porcelain teapots are best since they are non-porous and won’t pick up any flavours. Clay pots are porous so they absorb the smell and taste of teas over time; these are better for darker and stronger teas. Purists will have different pots for different types of tea. Unlike wine, I haven’t heard whether the shape of the teacup matters! – Heat the water to the correct temperature, then add a small amount to the pot to warm it up. Discard the water from the pot. – Add the tea leaves to warm pot & shake them around. If you smell the tea at this point, you’ll notice that the aroma is much richer than when it was dry and at room temperature. – Add the leaves and steep for the necessary amount of time. – Pour the tea into small cups. If the cups are white, you’ll notice that the different teas have their own distinctive colour. – Deeply inhale the aromas and try to detect different smells within it. – Take your first sip, and enjoy. We tried two different types of tea: a commemorative 25th Anniversary black tea, and a high quality Jasmine sphere tea. The differences between the two were striking. I found the anniversary tea to be lightly tannic, with a flavour that reminded me of green grasses and hay. The Jasmine sphere tea is named that way because it is formed into small spheres in its dried form, which then unfurl into long pointy shapes once steeped. It was of very high quality and the dried leaves smelled more strongly of Jasmine than any other tea that I’ve had before. The smell became even more intense after the leaves had been warmed in the pot. The taste was floral and lightly fruity, and had a very long finish. While it was full and rich in aroma and taste, it was very light and delicate to drink. This was my favourite of the two teas we tried. Like wine and coffee, high quality tea can be very expensive but unlike the former, you only need a small amount per cup and the leaves can be reused many times. Depending on the quality of the tea, you can get 5, 10, or up to 15 re-steeps. Compared to how many times a regular teabag can be reused, this makes the cost of high quality tea much more reasonable on a per cup basis. 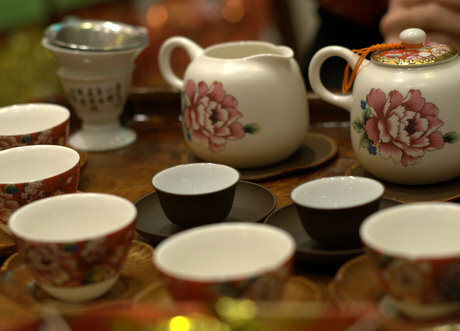 When visiting family and friends during Chinese New Year, you will always be served tea and a number of small sweets. The sweets are presented in a Tray of Togetherness, an 8 sided sectional box or tray made with rosewood or teak (modern versions are made of plastic or cardboard). Each of the 8 segments (sometimes with a 9th in the centre) is filled with something that symbolizes the sweetness of life. Candied nuts and vegetables are common (i.e. winter melon, lotus roots, dates) in additional to sugar candy. The contents will vary with each. 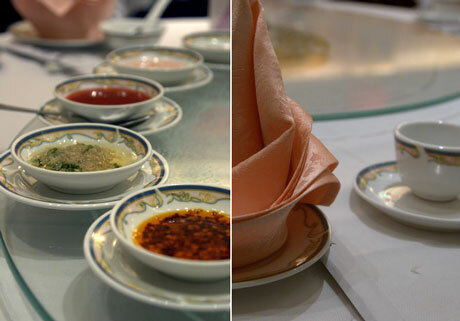 – There are 8 sections in the Tray because the word for 8 (“baht”) rhymes with the word for fortune (“faht”, as in “faht choy”). – The center and 9th section holds watermelon seeds dyed red. Seeds = children, fortune = red. – Chocolate gold coins = more wealth. – Candied winter melon = a continuous line of descendants like melons on a vine. – Red dates = the early arrival of good things; the name for date in Chinese rhymes with the word for “early”, red = fortune. The next stop was one of my favourite Chinese bakeries, Saint Germain. There are several locations in the Lower Mainland but they all sell similar products and are headed by Executive Pastry Chef Mickey Zhao. Chef Mickey grew up working in his father’s Chinese bakery but he was also trained for three years at Toronto’s George Brown College in their pastry program, and had apprenticeships in 4 star hotels. He was the Pastry Chef for Team Canada in the 2008 Culinary Olympics in Germany (held every 4 years), where the team won 4 gold medals and placed 5th in the world out of 40 countries. 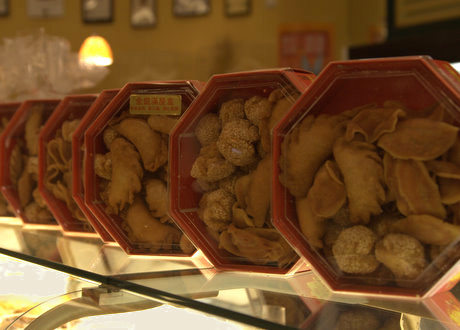 This combination of Chinese and Western influences is reflected in the baked goods. They are made fresh and from scratch, beautifully presented, and tasty. They have a number of specialty products available for CNY. People will purchase them as gifts or to be served to guests who come to visit. 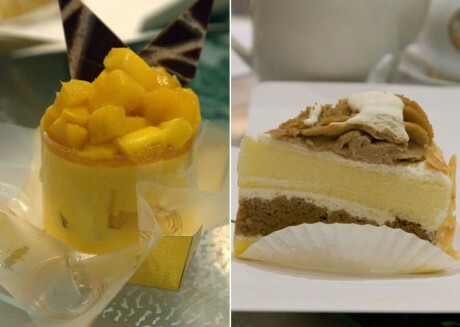 Most of them are cakes, but the word “cake” is used quite loosely in Chinese culture. The CNY cakes are dense, round, and can be savoury as well as sweet. “Cake” in Chinese rhymes with the word for “height” or “growth” so they symbolize rising fortunes, or the reaching of new heights in a better life. For children, it literally represents growth in height. The round shape also represents family continuity and unity. These cakes can be made at home but they are quite labour intensive and require hours of steaming. Unless one has a grandma or older female relative who makes them, most people will purchase them from bakeries or supermarkets. At Saint Germain, the prices vary between $8 and $11; more expensive than if you bought them in the supermarket but also of better quality. Because they’re so dense, one cake goes a long way. Slices are cut off as needed, and reheated before serving to guests. 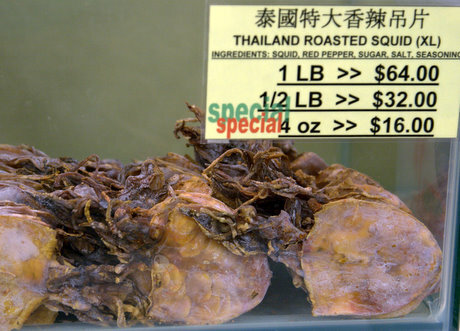 Savoury cakes are Seafood & Chinese Radish or Seafood & Taro; radish and taro are the main ingredient in the respective cakes, with pieces of dried shrimp, mushrooms, and Chinese sausage mixed in. Sweet cakes are Ginger, Osmanthus (a type of flowering plant), Coconut or New Year’s cake. All are made with glutinous rice flour and sweetened with some form of sugar. The most important variety is the New Year cake. It is mildly sweet, chewy and sticky, and it was my favourite growing up. Its distinctive flavour comes from Chinese brown sugar slabs. The stickiness represents family cohesiveness, and the sweetness is for a sweet life. Usually small portions of the taro, radish and New Years cakes will be available at dim sum restaurants during the CNY period. In addition to the cakes, bakeries will also sell special deep fried cookies. There are “little horns” (stuffed pastries filled with peanut, coconut and sesame), “cow tails” (short braids of dough), and “cow ears” (thin and crispy rounds of dough with red bean sesame paste). 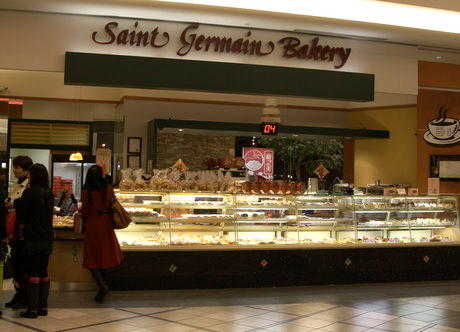 At Saint Germain, the cookie boxes are priced similarly to the cakes. The third tour stop was something that was new to me. I’ve walked by Kwong Leung Hing many times before but had always mistaken it for a herbal shop. 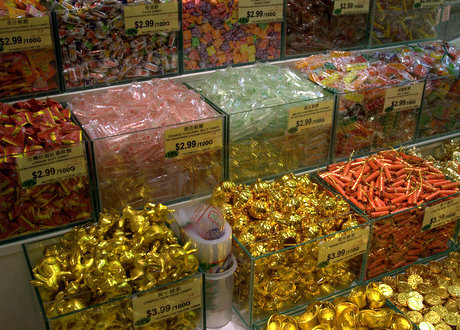 In reality it’s a candy and snack shop, with everything sold in bulk and by weight. The bins are labeled clearly in Chinese and English, which is definitely helpful for some of the more exotic items. It’s an ideal place to shop for things to put in the Tray of Togetherness. Most of the items were familiar to me but I hadn’t had them for many years. It was an unexpected surprise and a nice sweet trip back through memory lane. I’ll definitely be coming back here to see what other tasty things I can rediscover. The main event of the evening was an 8 course CNY banquet-style dinner held at Fisherman’s Terrance restaurant. In a traditional Cantonese CNY dinner, chicken, beef, pork, duck and fish will all be represented. These are the most important proteins, and the dishes that they’re served in will have symbolic meaning. 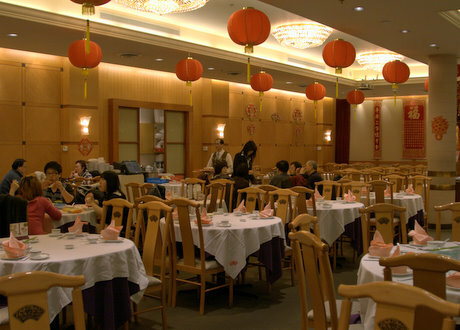 Most of Richmond and Vancouver’s restaurants will offer special menus for traditional CNY feasts. These are best done with a large group, preferably 8 – 10. 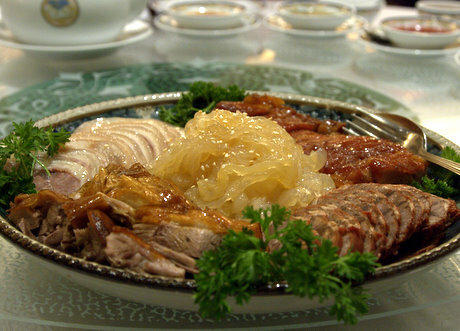 This is a cold appetizer platter with meats in various preparations: Marinated Beef Shank, Marinated Pork Hock, BBQ Pork, Roast Duck, and Jellyfish salad. The beef shank and pork hock are similar to headcheese, and the BBQ pork and Roast Duck are the same as what’s found in Chinese butcher shops. 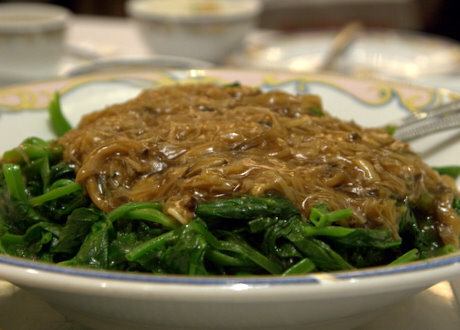 The jellyfish was tossed in a sesame dressing and while the taste is not unusual, the crunchy gelatinous texture can be something that takes getting used to. Overall this dish was very good, though the duck was somewhat gristly and there was a lot of fat under the skin. 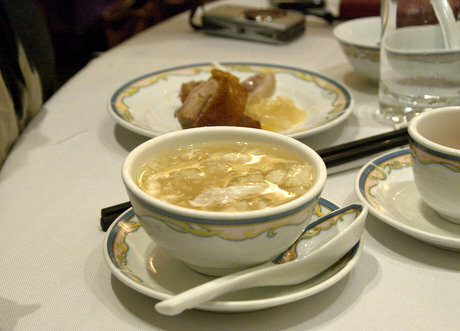 Our group was originally slated to have sharks fin soup but thankfully it was swapped out for another soup at our request. Fish maw is the swim bladder from a fish, and it has a soft gelatinous texture. The soup was mildly fishy (which is normal), with a viscous and starchy texture. A few drops of red vinegar added to the bowl helps to balance out the flavours. The roundness of the scallops brings to mind the shape of coins, so this dish symbolizes wealth. 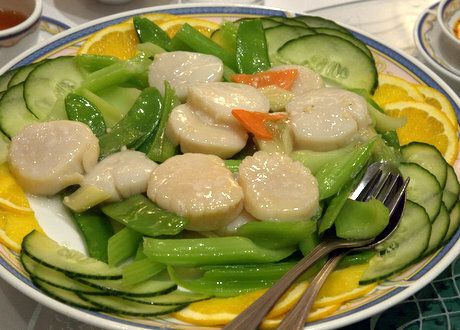 The scallops were tender and sweet, though the celery was tougher and stringy. This is a standard banquet dish, and always seems to come with the same celery/snowpea mix regardless of the season. 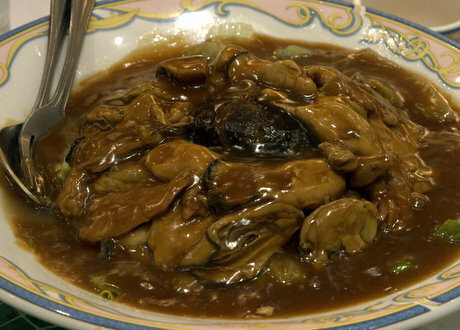 This dish of dried oysters soaked and braised with shiitake mushrooms and lettuce is symbolic for plentiful wealth. Cooked lettuce, with a long stretch of the imagination, looks like Chinese paper money from dynasty times (thin and like tissue wrapping paper). Dried oysters usually have a very strong flavour but they were prepared well here and didn’t overpower the other parts of the dish. It was also made with whole oysters, which is another quality indicator. Sometimes the dish is made with less expensive oyster pieces. 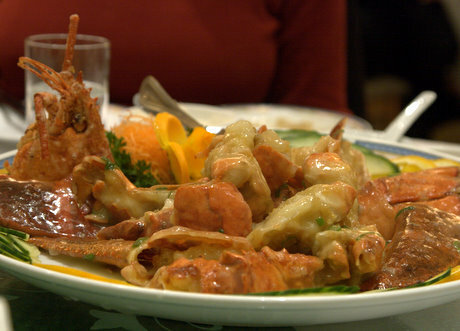 The name for lobster in Cantonese literally translates to “dragon prawn”, so this dish is consumed for the life and energy of a dragon. I found the meat was not very sweet but the sauce was fantastic and the best part of this dish (delicious over rice). Supreme sauce is made with ginger, cooking wine, stock, sugar, soy sauce, salt and green onions. The word for fish sounds like the one for “wish”, so consuming fish ensures that the new year’s wishes will come true. Fish also commonly swim in pairs, lay many eggs and have high birth rate so it’s a good dish for young married couples to eat. Our fish dish was steamed sea bass on tofu slices, topped with pickled Chinese vegetables, shiitake mushrooms, and minced pork. I think steaming is one of the best preparations for fish; it comes out smooth, tender and moist. Tofu and sea bass are both quite mild, so the pickled vegetable topping adds seasoning and flavour. The topping should be used sparingly since its strong taste can overwhelm the tofu and fish. 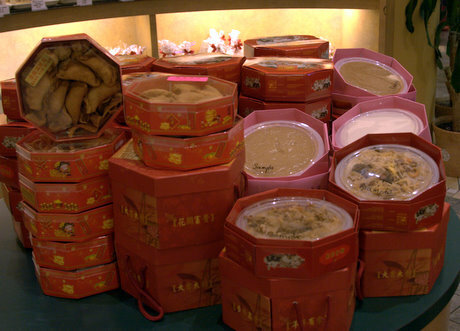 Dried scallops are a luxury ingredient, and CNY is also a time for indulgence. Like the celery in the other scallop dish, the pea tips were not very young or tender. The flavour was fine but it would not be my first choice for a vegetable stir fry. 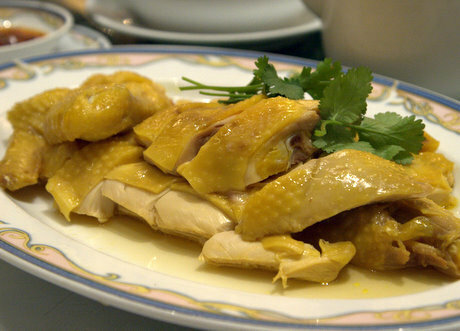 A free range chicken is poached whole in a flavourful stock, chilled, cut into pieces and served with ginger sauce. Cooking a whole chicken means that you will have a proper beginning and end to year, and represents the wholeness of life on earth. This was a tasty, higher quality version of the ubiquitous “white cut chicken” found in casual Cantonese restaurants and butcher shops. 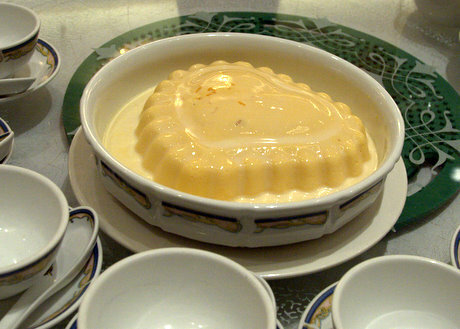 The 8 course meal ended with a whole mango pudding, served with evaporated milk. (This was the 9th course so I guess dessert isn’t as auspicious as the others?) This had a very mild mango flavour, and I could taste the milk more than the fruit. Mango is one of my favourite fruits so I was quite disappointed in this dish. Fortunately we had bought some small pastries earlier at Saint Germain and the group shared an excellent mango mousse cake and a chestnut slice. I had a great time re-acquainting myself with long-forgotten traditions and getting to know some of the local media. Thank you to Tourism Richmond for hosting such a fun evening. “Gung Hei Fat Choy “ (wishing you happiness and prosperity) and “Sun Nien Fai Lok” (Happy New Year). Great post Brenda! Makes me yearn for a trip out to Richmond for some food!